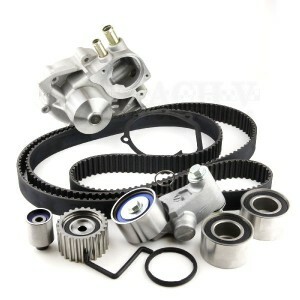 The timing belt is one of the most important parts of an engine. The Timing Belt is a rubber belt with teeth that turns and synchronizes the rotation of the camshaft and crankshaft so the engine valves open and close at the proper time during each cylinder’s intake and exhaust stroke to allow air and gas in and out, which causes the fuel to ignite in the combustion chamber. The timing belt also drives the water pump in 60% of cars. Some cars and trucks use timing chains or gears to perform the same function that more durable. But timing belts, made of rubber are lighter, less expensive, quieter and more efficient. 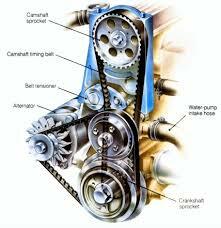 The use of a timing belts or timing chains enables the camshaft to be placed further from the crankshaft, and in engines with multiple camshafts, it enables the camshafts to be placed further from each other. In an interference engine the timing belt or timing chain are critical to preventing the piston from striking the valves. When the timing belt breaks, the valves will open at the wrong time and hit the pistons, causing major damage to the engine. Timing belts are made of rubber, over time with stress, heat and cold, the rubber becomes brittle and starts to crack. However, in most cases, there are no obvious signs the timing belt is about to break. That’s why car manufacturers recommend replacing the timing belt every 60,000 to 100,000 miles. Check your owner’s manual for the manufacturer’s recommendations, timing belt replacement will be in the preventive maintenance schedule. Ignoring the replacement of a timing belt as a scheduled maintenance, could result in major engine failure. Replacing a timing belt for preventive maintenance purposes typically costs $400 to $900. However, replacing a broken timing belt may cost up to $2,000 or more if it caused damage to the valves, pistons or water pump. While replacing the timing belt, it is highly recommended and cost effective to replace the water pump, pulleys and tensioners. The water pump continually pumps water and coolant to the engine so that it doesn’t overheat and generally has the same lifespan as a timing belt. Pullies keep the timing belt in line while tensioners apply pressure to the timing belt to keep it tight. The tensioners and pullies contain bearings that wear out or seize over time, causing the timing belt to slip off, leading to the same effects as a broken timing belt. Tears or cracks on the timing belt. Advanced Auto Repair professional technicians are trained and experienced in inspecting and replacing timing belts. We offer timing belt, water pump and tensioner replacement packages at competitive prices. Stop by our North Attleborough repair shop and we can help you avoid timing belt issues. Our experienced mechanics can detect potential belt and hose problems with a simple visual inspection.